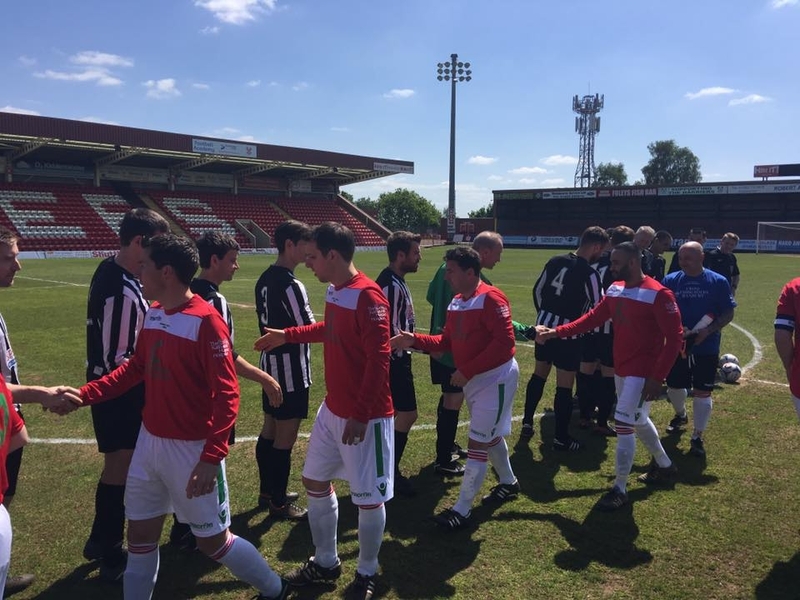 We recently sponsored one of our Heating Engineer's participation in the Hospice Shield - a charity football match to help raise funds for Helen & Douglas House and Katherine House Hospices. After the success of previous fundraising matches hosted at MK Dons in 2012, and Wolverhampton Wanderers in 2014, a third Hospice Shield was organised for 14 May 2016. 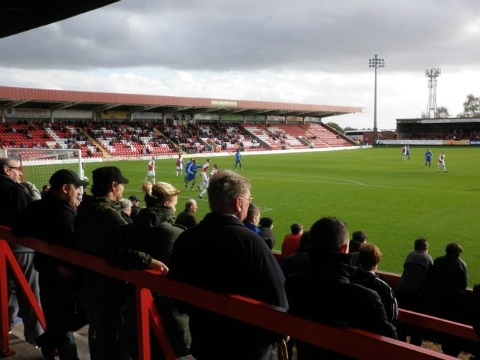 Taking place at the Aggborough Stadium, home of Kidderminster Harriers Football Club, this years' Hospice Shield saw a King's Park XI take on Deddington Town Football Club. Formed in 1888, Deddington Town F.C. is one of the oldest football clubs in Oxfordshire. With 13 teams, from under 7's to men's first and reserve team, Deddingon Town F.C. attend weekly training and were bound to give the King's Park XI a tough game. "He's One of Our Own!" After playing in the previous two Hospice Shield events, our Heating Engineer, Andrew Simpson, played once again for the King's Park XI. In a mix-n-match team, the King's Park XI had a tough time against an organised Deddington Town. Whilst managing to put two in the net, Deddington Town F.C. eventually won the game 4-2. In addition to the football, there was a raffle containing superb prizes, and a special guest appearance from ex-professional footballer and Sky Sports commentator, Tony Cottee. A total of £2,267.50 was raised and split equally between the two hospices. Thank you to everyone who supported this wonderful cause! In addition to the Hospice Shield, we have selected Helen & Douglas House Hospice as one of two chosen charities when our Wolf Pack brave The Wolf Run on 3rd September 2016. Helen & Douglas House provide hospice care for children and young adults. Opening in November 1982, Helen's House was the world's first children's hospice, setup to provide personalised respite care tailored to individual needs. Whilst Douglas House provides an environment specifically for young adults, providing the time to do thing they like to do with the support of a nursing and care team. For more information about Helen & Douglas House, our participation in the Wolf Run on 3rd September and to donate towards the cause, please visit our JustGiving page today!